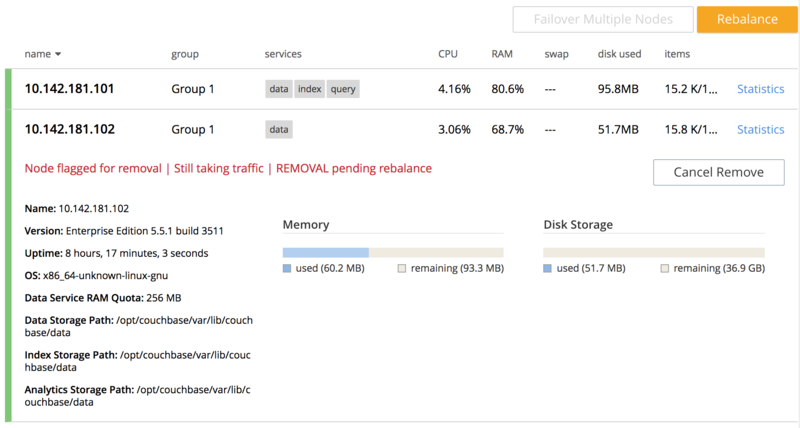 Couchbase Server allows a cluster node to be removed, and the remaining nodes rebalanced. The rebalance operation distributes active and replica vBuckets across available cluster nodes in optimal fashion. This allows the best possible data-availability to be maintained after nodes have been added or removed. Examples of using rebalance after node-addition have already been provided, in Add a Node and Rebalance and Join a Cluster and Rebalance. In particular, reference was made in both locations to the data initially resident on a single node being replicated and distributed, across two nodes, following node-addition. Nodes can also be rebalanced following removal: this is demonstrated in the current section. When a node is flagged for removal (as opposed to failover), new replica vBuckets will be created on the remaining nodes, as node-removal occurs. This has the effect of reducing available memory for the specified number of replicas. A two-node cluster already exists; as at the conclusion of List Cluster Nodes. This indicates that node 10.142.181.102 has been flagged for removal, and is still taking traffic. A rebalance must be performed to complete removal. Note that all 31.1 K of Items (from the travel-sample bucket) are again solely located on 10.142.181.101, with no replicas (since at least two nodes are required for replication to occur). For more information, see the command reference for rebalance. The command returns no output. Nodes can be failed over, so that an unhealthy or responsive node can be removed from the cluster without application-access being affected. See Fail Nodes Over.